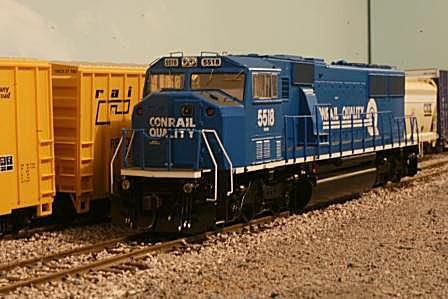 This Athearn Genesis HO model captures the lines of Conrail's SD60Ms perfectly. These were among the last of the SD60M's built. ©2011 Ryan C Kunkle, licensed to About.com, Inc. The SD60M was part of EMD's successful 60 series and EMD's first "Third Generation" diesel with the new "comfort cab" design. Five years after the introduction of the new SD60, EMD began offering an improved design with a new cab. These "wide cabs" had been in use in Canada since 1973. The cabs are not really any wider than the traditional cab, but the width is extended all the way to the front platform without the two small walkways on either side of the traditional short hood. Known as North American, safety or comfort cabs, these units offered greater crew comfort and safety with the addition of large crash posts inside the nose. Both EMD and GE offered their first wide cab designs for U.S. markets in 1988. The first SD60M (EMD's designation for the wide cab) locomotives were 25 units delivered to Union Pacific the following year. Sixty SD60s were built for Canadian National by GM in London, Ontario. In addition to the wide cab, these locomotives were also equipped with a full width carbody. Hence they were classified SD60F. Internally, they were identical to other SD60s. The first SD60M designed featured a three-window cab with a non-tapered nose. In 1991, the design was modified to include a tapered nose and two-window windshield which increased crew visibility and cut manufaturing costs. Union Pacific and Burlington Northern owned locomotives of both designs. In 1994, a new variation was introduced on Conrail No. 5544. This "Isolated" cab design further improved the cab by reducing noise and vibrations. These would go into production as SD60I models. Originally built for only 4 railroads, today most of the locomotives can still be found in service on their original roads, or for new owners acquired through mergers. -Prototype History compiled from EMD's SD60 Series; Steppingstone to the 21st Century by Diesel Era, 1996. The SD60M has been reproduced in many scales. Used on railroads all across the continent, these locomotives are a good fit on almost any layout set in 1989 or later. In addition to being offered in several popular scales, appropriate two and three-window cab versions are also offered by several manufacturers. The locomotives have proven to be incredibly versatile and can be used on just about any type of freight train. Thanks to modern run-through and power pooling agreements, it is not uncommon to find these locomotives off-line earning their keep for another railroad as well.